Animal camouflage is a very common technique. And when it comes to an open sea, things ought to look slightly difficult. However, for fishes like herring, mackerel, and sardines this is not the case. These fishes have a smart camouflage technique, the shimmering silver scales, that can even beat the super sight. The silver scales of the fish act like mirrors that assist them in mingling better. The scales throw back the reflection of the watery surroundings. This reflecting effect acts as an invisible cloak that aids them to hide in plain sight. Unlike human eyes, eyes of several marine species have the ability to see through the silvery camouflage. Such animals can identify a property of light known as polarization, rendering invisible cloak ineffective. Animals like octopuses, shrimp, squid and other crustaceans and fishes like trout and salmon are equipped with polarized vision. 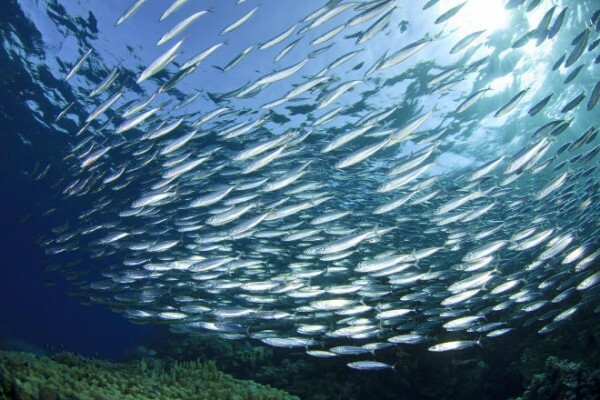 In a study to understand how good marine animals detect reflective camouflage in the sea, researchers from Duke University took photographs of different kinds of silver fish with the help of a custom-made camera fitted with polarized lens filters in the sensors. Using a computer model, the research team analyzed the pictures and imitate the way marine animals processed polarized light. The findings indicate that polarized vision can detect a reflection of polarized light (reflected from the silver scales) against the backdrop of open sea water. However, the finding from the study revealed that polarized vision did not aid animals in spotting silvery fishes from any further distance than they could in the absence of this special vision. Hence, it does not give any real benefit. In such environment, sighting distance is very imperative as predating. And to escape from being hunted in the open sea is all about noticing the other animals first before they see you, said professor of biology, Sonke Johnson. Johnson further added that it is still a mystery why so many marine animals can detect polarized light and what’s the real purpose.